There’s a fudge boutique in the little town of Montville. Other sweets and delicacies line the walls, but the highlight is the fudge counter. Chocolate and vanilla fade to raspberry and tiramisu, then lunge wildly into chilli, macadamia. The lady behind the counter, an engaging red-haired Aussie, offers wafer-thin samples of any block you glance at twice, while chattering away happily about her forthcoming travels to Scotland. It’s not one of those sweet shops which tries too hard to fling you into an imagined past; rather, it just seems timeless. Pleasing in every detail, almost painfully quaint. This is a lot like Montville as a whole. It couldn’t be pleasanter if it tried—indeed, if it tried any harder, that would ruin the pleasant. It’s the most picturesque little mountain town you can imagine. It’s obviously run on passing trade, but it doesn’t feel touristy. It doesn’t make you feel like a tourist; you’re more of a visitor. A visitor faced with an overwhelming selection of cafés—although we were pretty confident we found the jackpot. A little terraced number, linked to a junk-and-antiques store, serving up blueberry pancakes and scones. How’s that for a Monday morning? …knowing people who can drive is a fantastic idea. Me and Rachael travelled to Toowoomba on the Friday, so that she could nab her dad’s car for the weekend. A night with the Murrays, and then we were off to the Sunshine Coast. You might remember this post, where I talked about visiting the Gold Coast, the same place I spent the amazing New Year that somehow never got itself a blog entry (floods). The Sunshine Coast is the other direction; north of Brisbane instead of south. And its a completely different feel. The Gold Coast was the perfect place for what we did there; having a place to crash, having almost-too-many drinks, having plenty of music and lots of bright lights everywhere. The Sunshine Coast is more, well, more Montsville. Not that that’s all we got up to. I love the idea of a road trip. They seem a bit of a silly idea in the tiny-and-busy UK, but this was only a couple of hours driving, and still accumulated that awesome road-trip feel. The window of the car got stuck down, so the air blasted into my face as we drove north to rendezvous with Thomas on the Sunday morning. We alternated mp3 players in the car stereo. We stopped and bought pies. We chilled out hard, like youth with a purpose. Our American comrade procured, we were there. The Sunshine Coast, QLD…yeah, sounds nice, doesn’t it. It was. First stop, quite naturally, the beach. The board, time and again, jackknifed treacherously beneath my fumbling, shot high out of the water, and landed again with a cadence of mockery. My Aussie companion laughed in amazement; to these water-borne folk, all manners of splooshery come as naturally as walking. Bloody hot-climate types. Mind you, there’s a flipside. When we hit the beach at Caloundra, my first attempts at catching a wave on the board (body, not surf; lying, not standing) may have been hilarious, but it did mean that when I finally clicked the technique, I got to experience the amazing rush of my first time scooting head-first from chest-deep to ankle-deep water ocean, borne along by the exhilirating rush of surf. Would that I could drag this aspect of Australia back with me in July; that I could carry the climate around in a bag like Odysseus’, and unleash the sunshine any time I wandered past a body of water. When (sort of, not really, just two more minutes, oh fine then) beached-out, we headed up the coast to Maloolooba, to find a place to stay. 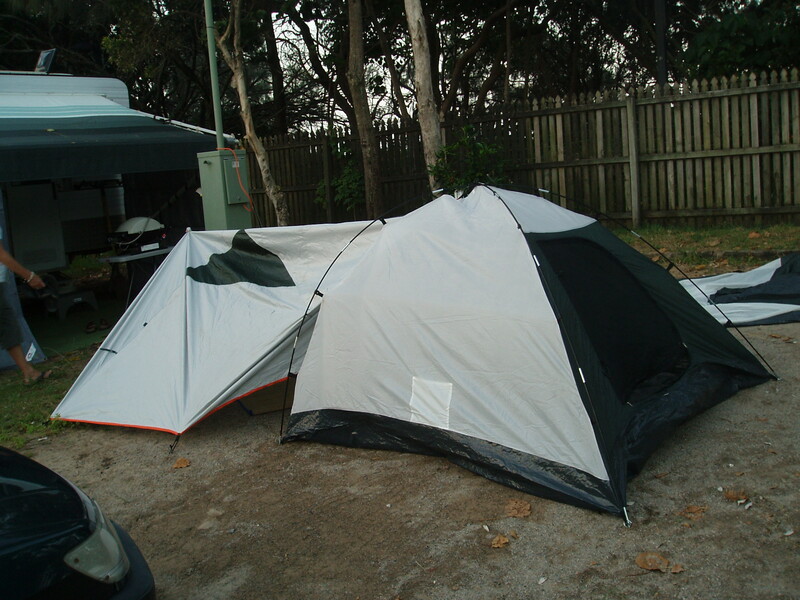 We booked a spot in a campsite, put up the tent, realised it was way too small for three. Despite the fact that I ended up sleeping (soundly and happily) outside on the grass, the lean-to which I made out of a tent cover and length of wood was a work of engineering brilliance. Whatever Thomas may think. A night of kebabs, fire-twirlers, photography and banter in Maloolooba, a night of sleep. 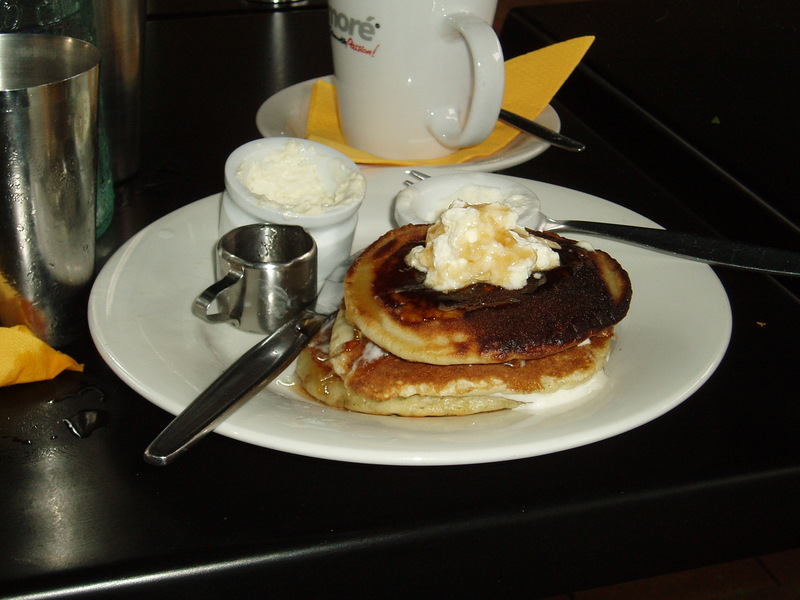 And then to Montville, for the pancake-flavoured hinge of our trip. My friends and loyal readers, become obscenely rich (to pay for fudge, fruit and petrol), and then spend the rest of your lives driving around Australia between beaches and cafés. It’s the life. And one last stop before the return trip. Into the hills, into the Hinterlands, and into a car park. On foot, then, through the subtropical rainforests. Thomas, the biologist, stopped intermittently to photograph millipedes. Me and Rachael, the impatient, walked on ahead and left arrows made of sticks for him to follow. There was somewhere worth getting to. A waterfall arched gloriously away from the cliff overhead. Beyond, the stream continued down along a giant valley through forested hills, to mountains in the distance. 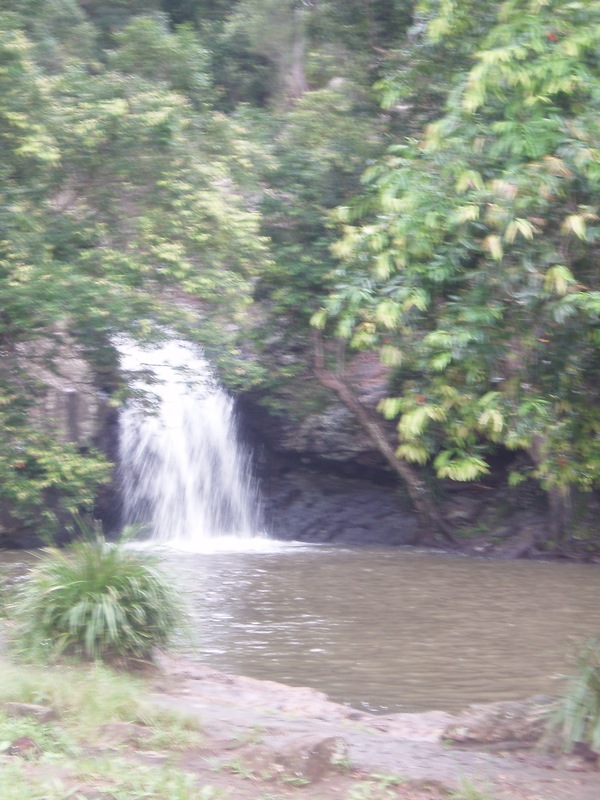 And in between, under the falls, a huge rock pool. Unknowably deep, cold enough to invigorate, warm enough to swim in. Leeches couldn’t batter its glory. My weak swimming brought no more than brief pangs of resentment. Nature green in leaf and water. Tranquil loose in joy and splendour. I’d like to thank the world for these moments. Sounds like you had a fun Aussie summer! Next Post Aran Ward Sell, Restaurant Critic NO MORE.